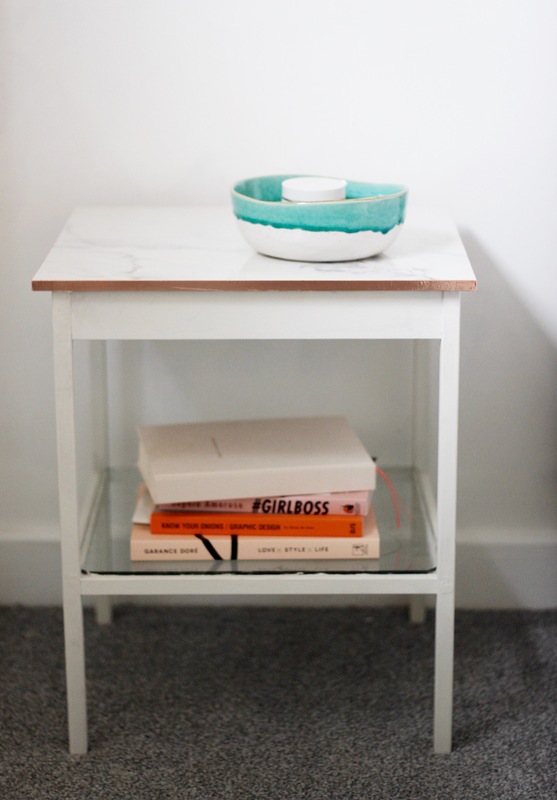 Copper and marble bedside tables. An Ikea hack. The last couple of months have been somewhat of a blur of building dust and disorientation. These things are all going on… 1. The upstairs of the house has been knocked down in the middle 2. We’ve has builders starting work at 8am in our bedroom Monday-Friday while we are still using it to sleep in. The baby is turning 2, learning to use a big bed and learning to get up, find me in the night and make sure I am awake and giving her attention. Kicking has proven most effective and the method so she seems happy sticking with that. There have been so many changes and wonderful things to buy and make for what feels like an entirely new house… where to start? Well an Ikea hack, of course. A good cheap one. I feel like I have looked at every. bedside. table. in the whole world. Its not been an item that’s justified being on the spendy items list. It’s hardly an investment piece. Nevertheless, the bedside table is there, faithfully standing by you night and day and looking after all the little nick nacks most precious. It deserves to be at least a bit lovely. I decided that I wanted marble. And copper is, of course, a fave. I have a painted bed so a standard Annie Sloan job to a normal wooden bedside table wasn’t going to cut it. I wanted something a little more statement. I actually didn’t really have a spare £400 to get one I really liked… make that £800 for a pair of them. £11 seemed like a better idea. I bought a couple of the Ikea Nesna bedside tables. I didn’t want anything too chunky and these are delicate, light, yet still have a storage shelf so you don’t have to be overly minimalistic. They’re also £9 – ahhhh, hurray for that. I painted the whole lot up first with Annie Sloan Old White and wax. The top shelf is glass but I didn’t insert that when putting it together and wanted to use that as the middle shelf. The slats across are rather charming but I opted to leave them out and rotate the 2 sides by 90 degrees so that the middle shelf doesn’t show the holes for the slats. I then stuck the glass (which should be the table top) onto the frame. I used tile adhesive for this but in hindsight I think using a glue gun would have been less messy and less visible. After I’d put it all together I tightened the screws so they went in as far I they would go and used polyfilla to cover them. (sanding this down and applying paint again) I wanted to place it so that the widest side faced fowards so these silver screws would have been a little obvious otherwise. The marble effect table tops are made from floor tiles. I decided these were more durable and had a much smarter feel than adhesive plastic coating. They were also cheaper. I ordered 2 different styles of sample marble floor tile and they were delivered to my door for the grand total of £2.50. They were much bigger than that table top but we had a borrowed tile cutter to do the bathroom so chopped them to sit over the top of the table with a couple of cms overhang. I expect I could have found ones closer to the table size (I actually ordered the tiles before I had even chosen the table). The edging didn’t actually look as bad as I expected. I thought it would look very raw and exposed but I could have happily left it as a tile top (there’s a post on my instagram of this mid-way stage with just the tile on the table with the slats still on). I do like a fancy finishing touch though and had ordered this copper tape from amazon and used it (just as a sellotape but with much sharper edges… be warned) and wrapped it around the tile edge. It just so happened to be exactly the same width. (I am of course going to pretend I measured it and ordered the perfect one intentionally… my dad thinks I am a scatty, disorganised decorator so I love a good fluke) I used tile adhesive again to attach the tile to the top of the table frame. I am by no means a tidy diy-er and am fully aware these could have been made a whole lot better by a more patient person who doesnt rush decorating jobs at 1am in the dark. Someone else out there could make a beautiful go of these. If so please tag me so I can see and feel like a useful sort of soul. Love the copper tape accent 🙂 Looks great with the marble !